Biography of Modern Romanian Sculptor. The Kiss (1908) Kunsthalle, Hamburg. 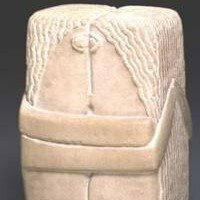 One of the great modern innovators in the history of sculpture, Constantin Brancusi was an extraordinary combination of folk carver and highly sophisticated modern artist. He was born in 1876 at Hobitza in Oltenia, Southern Romania, of poor peasant stock. In 1883 he was put to work as an apprentice shepherd in the Carpathian mountains. It was at this time that he first learned wood carving. He was to prefer carving to modelling all his life. "The work of art," he said later, "requires great patience, and above all a determined struggle against the medium." Later Brancusi worked as a dyer, as an assistant in a grocer's shop, and then as a servant at an inn. While working at the inn he was challenged to make a violin as a bet. He succeeded so well that he came to the attention of a rich manufacturer who sent him to the local school of Arts and Crafts. It was only then that he taught himself to read and write. a great example of avant-garde art. In 1896 he won a scholarship to the Fine Arts School in Bucharest - his first contact with the world of sculpture. At this time he was producing academic work, in the standard fashion of the day. On the proceeds of a couple of sales, he was able to leave Bucharest for Munich in 1903. But he found Munich unsympathetic and decided to set out for Paris, travelling on foot because he had no money left. He arrived after a journey during which he received much help from peasants and country people who (he said) immediately recognized him as one of themselves. Paris, the city of Picasso and the avant-garde, became his home for the rest of his life. Supporting himself by doing odd jobs - he worked first as a dishwasher, then sang in the choir at the Romanian Orthodox Chapel - he continued his studies at the Ecole des Beaux-Arts, under an academic sculptor called Antonin Mercie. Dedicated to his sculpture, he pasted up strips of paper in his make-shift studio, which carried admonitions in red letters: "Don't forget you're an artist", "Don't be discouraged". "Don't be afraid, you'll make it!" "Create like a God, order like a King, work like a Slave!" Proudly, he refused an offer to study with Auguste Rodin (1840-1917), whom he admired enormously. "Nothing," Brancusi said, "ever grows well in the shade of a big tree." In 1906 Brancusi exhibited his work in public for the first time since leaving Romania, and in 1907 he received his first commission - a statue for the tomb of a compatriot. Another tombstone followed the next year. This was "The Kiss", an abstract sculpture with two embracing figures locked together in the same block of stone. In style this announced Brancusi's mature work; the theme itself was one which he was to use repeatedly for the rest of his career. 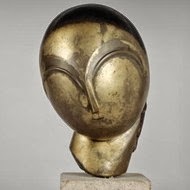 By this time Brancusi had made many friends in the Paris art world. Among those to whom he was closest were Amedeo Modigliani (1884-1920), whom he taught to carve, and Henri "Le Douanier" Rousseau (1844-1910), who once said to him jovially: "Well, old boy, you've made the ancients modern." No more perceptive remark has ever been made about Brancusi's work. Another friend was the difficult Chaim Soutine (1893-1943). The two men used to go to the Bobino Music Hall and the Theatre de Montparnasse together. They relished the bedroom farces presented there, and sometimes made such a noise that they were thrown out. He also began exhibiting his work at the Salon d'Automne, along with other Russian expatriates like Alexander Archipenko and Ossip Zadkine. In 1913 Brancusi's reputation as one of the leading abstract sculptors was established in the United States, thanks to a group of five pieces included in the New York Armory Show. The patronage he found there, and at "291", the gallery owned by Alfred Stieglitz (1864-1946), where he had his first one-man show in America (1914), considerably eased his financial situation, and the charm and simplicity of his nature won him yet more friends, though he could be secretive and sometimes touchy. Part of his secretiveness may have been due to a desire to conceal his gay status. He had no known close relationships with women, and once took off on an improvised trip to Corsica with the young writer Raymond Radiguet, notoriously Cocteau's lover. But Brancusi was not reclusive; he would entertain in his studio. cooking superb meals in his kiln. It was noticeable that he retained many basic peasant qualities, among them an obsessive fear of the devil and of magic spells. The artist Max Ernst (1891-1976), who was his neighbour, once made the mistake of giving him a carved hand from Africa. Brancusi soon became so afraid of it that one night he threw it over the fence, and ever afterwards harboured a grudge against the donor. To learn how to evaluate modernist sculptors like Constantin Brancusi, see: How to Appreciate Modern Sculpture. For earlier works, please see: How to Appreciate Sculpture. During the inter-war period Brancusi unwillingly played a starring role in two major artistic scandals. In 1920, after a period during which he had submitted no work to any of the major Paris exhibitions, he sent his sculpture "Princess X" to the Salon des Independants. It was denounced by a die-hard faction as indecent (they thought it resembled a phallus) and the police were summoned to remove it from the show. The poet Blaise Cendrars and the Cubist painter Fernand Leger (1881-1955) immediately brought it back, but the incident left Brancusi permanently disgusted with the Paris art world. and he refused ever to exhibit in Paris for the rest of his life. In 1922, he sat for the famous American lens-based artist, Edward Steichen (1979-1973) who created his celebrated Portrait of Constantin Brancusi. In 1926, when he arrived in America for an exhibition of his plastic art at the Brummer Gallery, the Customs Office refused to admit "Bird in Space", one of his most abstract pieces, as a duty-free work of art. Brancusi was forced to pay duty to get the sculpture released. and sued the Customs Office for the return of the money. He won his case, though the verdict was not published until 1928. Meanwhile, the uproar had ensured the success of his show. Brancusi travelled quite widely at this time: to the United States; to India in 1937, at the invitation of the Maharajah of Indore (the temple he designed for this patron was never built); and back to Romania, where he had been invited to make a series of monuments for the public park at Tirgu Jiu in his native Oltenia. Completed in 1938, this work was attacked by the local press, already very fascist in its sympathies, but Brancusi was satisfied to have seen some of his ideas carried out on a large scale. "Simplicity", he said, "is at the bottom of complexity, and one must be weaned on its essence to understand its significance." Brancusi moved to his last studio, at 8 Impasse Ronsin in 1918. The building had formerly been occupied by Madame Steinheil, the central figure in a notorious murder case. Brancusi furnished the studio with his own hands, in a style of peasant simplicity. With the coming of the Second World War he withdrew more and more into this private world. He made little entirely new sculpture, or bronze, though he continued to recast old ideas. In 1948 two young Romanian painters, Alexander Istrati and his wife Natalia Durnitresco, settled next door in a deserted building and henceforth kept him company. His health began to deteriorate, especially after a fall in 1954 in which he broke his thigh, but he was determined not to leave his own surroundings. He died in his studio on 16 March, 1957. He was the greatest Romanian sculptor in the history of art. Source: We gratefully acknowledge the use of material in the above article from Edward Lucie-Smith's outstanding book "Lives of the Great Twentieth Century Artists".  For information about modern ceramic sculpture, see: Ceramic Art.